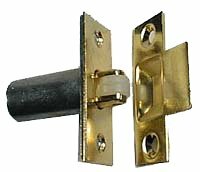 Adjustable roller catches are a popular alternative to ball catches and mortice latches for securing internal doors that require just a push/pull handle and are particularly suited to ill-fitting doors as the the latch can be turned outward to catch even when you have a large gap between the door and it's frame. The latch is adjusted by inserting a flat-bladed screwdriver into the slot in the nylon roller - pushing it in and turning it 180 degrees clockwise to recede or anti-clockwise to loosen the mechanism. 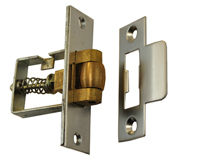 It is easy to fit and requires a 22mm flat wood bit for recessing the body of the latch.